A boy was put in isolation at his school for having his hair cut too short, his mother has said. Marshland High School has refused to comment. Mrs Steel posted a photo of her son on Facebook, saying: "They say his hair must be appropriate for a professional learning environment. He must remain in isolation till his hair grows back." Her post has so far been shared more than 77,000 times and more 30,500 people have commented. 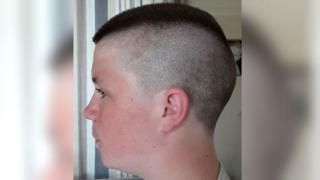 Damon, an Army cadet, had his hair cut on 19 June. The barber gave him a "number three on the top and a zero at the sides", he said. Image caption Damon, whose hair has now grown slightly, said he wanted to get back to "normal education"
Damon said he had no idea there was a rule about having hair too short. He was told he must have classes in isolation until it grows, but Mrs Steel said "that could be weeks". Instead, she opted to remove him from school altogether. "I always thought isolation was for pupils who'd been naughty, or bullies. Damon had a haircut," Mrs Steel said. "Why victimise him for a haircut? "I'm keeping him off school because I don't agree with sending him in for isolation." Mrs Steel is due to meet the head teacher to discuss the matter.